This feature allows you to restrict viewing and log in access to only designated IP addresses. If a user tries to view or access the site from an IP that is not provided, they will not be able to access the site. This includes logged in users and logged out users. This feature is especially valuable if you only want your site viewable by certain people or location such as your company network. An IP (Internet Protocol) address is a unique address that devices like computers, phones, routers, etc., all use to identify itself to communicate with other devices in a network. You can enter in a single IP or a range of IP. Check Enable IP Restrictions and additional options will appear. Under Restrict these Sites select which sites you want to restrict. In some cases, you may want to allow certain user roles to be able to access your ProProfs site from outside of the allowed IP restrictions. 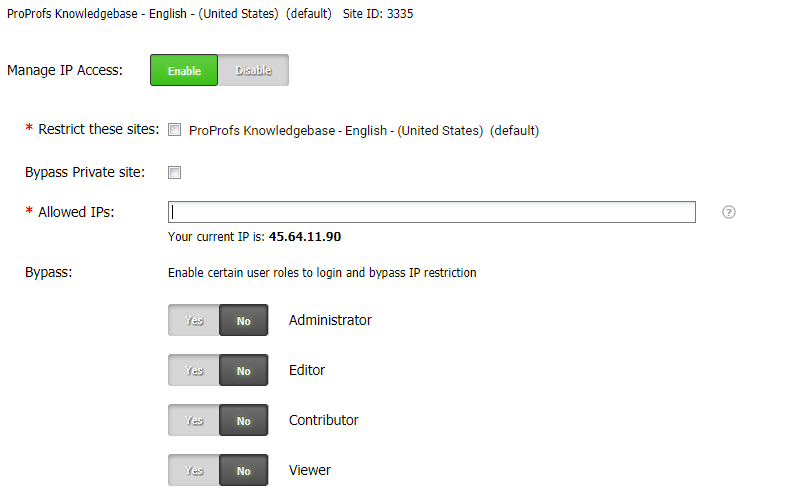 To enable the feature, select the user roles you want to be able to access the site regardless of the IP restrictions.